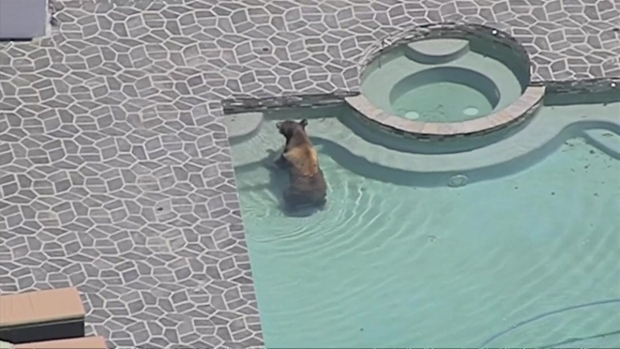 After taking taking a summer dip in a backyard pool in Granada Hills Tuesday, a bear was shot with a tranquilizer dart, and taken into the care of wildlife officials without any harm to humans. The bear, which had a red tag from a prior encounter with officials, is estimated about 3 to 5 years old and weighs 250 to 300 pounds. It was reported along the 1500 block of Timber Ridge Drive and wandered across front yards near the 13000 block of Whistler Avenue. The bear relaxed in the cool water for a few minutes, finding relief from the humidity and 90-degree heat. It climbed out of the pool, hopped a block wall and continued exploring the San Fernando Valley neighborhood. A bear was spotted in a Granada Hills backyard on Tuesday, July 17, 2018. He took a dip in a pool as police and other authorities watched closely and advised neighbors to stay away. The bear had been seen wandering through the neighborhood all week, some residents said. "I was just in shock," said Alexandra Rojas. Added Claudia Jablonski: "My dog just went crazy." The bear later stopped by Bee Canyon Park, while police and wildlife officers watched his every move. The sojourn ended when the bear was hit with a tranquilizer dart and carried away in a pickup truck to be set free in another location later.